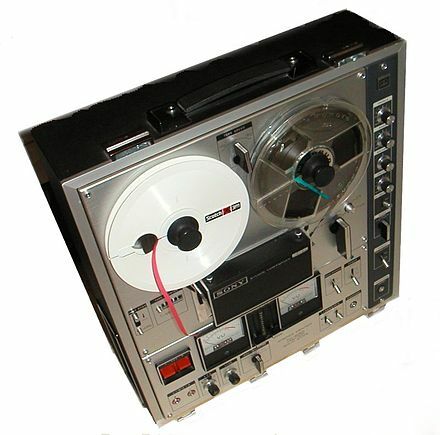 When I was young I was fortunate to have a reel-to-reel tape recorder, an advanced model for casual home use. I could put my hands on the equipment, without the bothersome shell that encloses a cassette. This allowed me to experiment - and I generally experimented with anything that entered my bedroom. For example, I slid my finger under the moving tape, raising it up a fraction of an inch. I had to be careful, for if the tape rose too high it would slip out of its slot, also known as the transport, and then I would have to stop the machine and rethread the tape. But raise the tape just a few millimeters, and the bottom strip ran across the head, as though it were the top strip. The music on side B was playing, but the tape was running backwards. This was an easy way for a ten year old to play his music backwards with no harm to the media. (I played my records backwards too, but that generally damaged the record, and would have damaged the needle and tone-arm if I had continued my mischievous ways.) With blank tape in hand, I recorded my voice, flipped the wheels over, pressed play, raised the tape just a bit, and listened to my voice in reverse. How cool is that?! I did the same for various sounds around the house: the piano, the dog barking, the chimes on the clock, the doorbell, etc. This was not a trivial venture, since the unit was bulky, and not terribly portable. During normal operations, the tape spools from one wheel to the other, but the mechanics are a bit more complicated than a bird's eye view would suggest. Inside the transport, just downstream from the head, is a spinning capstan, a small metal cylinder that stands upright and actually pulls the tape along. Push play, or record, and a rubber wheel, called a pinch roller, presses the tape firmly against the spinning capstan. The motor that turns the capstan is precise, moving at a fixed speed. It joins the pinch roller to pull the tape across the magnetic head at exactly 1 and 7/8 inches per second. (Professional musicians use a higher speed for improved fidelity.) Why is this precision necessary? A keen ear can detect a change in pitch of 0.6%. Raise or lower the frequency by one part in 150, and the note is perceptibly different. Suppose the tape has recorded a perfect sine wave of 440hz, A above middle C. If the tape moves just a bit faster across the head, say 1.886 inches per second instead of 1.875 inches per second, you might notice that the note is just a bit sharp. If the tape slows down to 1.863 inches per second, the note is flat. The speed must be steady and constant during recording and playback, hence the capstan motor is a critical part of the machine. Sound is recorded on tape through magnetism, so on a whim I tried the same thing with a wire. I straightened a metal coat hanger, as straight as it could be, and placed it in the transport. When I pressed record, the take-up wheel spun, but there was no tape to spool onto the wheel. That's not a problem. Meantime, the capstan and pinch roller pulled the wire through the transport at the prescribed rate. I recorded my voice on the wire, approximately 15 seconds of speech, then sent the wire back through the transport on play. Yes indeed, my voice could be heard, quietly, but clearly. I flipped it around and ran it through again to hear my voice in reverse. Of course a coat hanger is thicker and stiffer than tape, and it's a wonder I didn't damage the machine. Ok - that's enough of shoving foreign objects through the tape recorder. Let's return to magnetic tape. The machine comes with an empty wheel that acts as the take-up wheel on the right. Blank tape, or prerecorded tape, comes on a supply wheel that you place on the left. Take the end of the tape and thread it through the transport, past the magnetic head, and past the capstan, and past the rightmost pin. Fold the end of the tape over to make a small loop, and place this loop on a spindle that is inside the inner rim of the take-up wheel. Turn the wheels by hand for a couple of revolutions to set the tape. Then you're ready to play, or record, or even fast forward. With the machine playing, take your finger and stop the take-up wheel on the right. It only takes a slight pressure. The capstan continues to push tape out of the transport at 1.875 inches per second. In a few seconds you have several inches of tape laying on the machine. Before it tangles or crumples, release the front wheel. It quickly takes up the slack. The front wheel is designed to spin faster than the tape plays, to maintain a slight tension as the tape leaves the transport. On the other side, the supply wheel has a small drag, to keep the tape taut on the left. Thus the capstan pulls the tape smoothly across the head for faithful recording and playback. Press the fast forward button, and the capstan continues to spin at the same rate. In fact this motor runs whenever the machine is active. That is the simplest design from an engineering point of view. However, the pinch roller does not engage, and the tape is not clamped against the capstan. It is free to fly through the transport, and indeed it does, pulled by the take-up wheel at high speed. In fast forward or rewind mode, the machine continues to "play". In other words, the electronics are not disabled. You can hear the music fly by and super-high speed. Hey, if you don't like the sounds, you can always turn down the volume. But listen to the sounds at least once, and notice that the frequency gradually increases as the tape flies by. The reason is simple. The right wheel spins at a fixed rate, so many revolutions per minute. At the outset there is very little tape on the wheel, so the effective radius is small. Inches per second is proportional to radius, and the speed of the tape is the speed of the music that you hear. As the right wheel fills up, the radius increases. Near the end, the tape flies through the transport three times as fast as it did at the beginning. Stop the machine halfway through, and notice that the supply wheel, which was free to spin, comes to an abrupt halt, thanks to an internal brake. Without this feature, the supply wheel, endowed with angular momentum, would continue to spin, and spew its tape all over the machine, creating a tangled mess. Press fast forward again, but this time hold down the record button. (I don't think you're suppose to do this, but I found a way.) Remember that the electronics continue to operate, so I was able to record at high speed. Rewind the tape and hear the sounds backwards, though they may be a bit slower or faster, depending on the amount of tape on each wheel. The speed through the transport is the same, forward and backwards, if&only if the supply wheel and the take-up wheel have exactly the same amount of tape. In other words, the two radii are the same. But of course the fun is in playing the sample at normal speed, which is incredibly slow relative to the recording. I slowed down my voice, and many other sounds around the house, including the toilet, a source of endless fascination for children everywhere. When the batteries in a portable cassette player run down, the wheels turn slowly, and the music drags along, with its pitch reduced proportionally. This can be heard in the movie Apollo 13, as the astronauts play their music in a cold dark capsule on the way back to earth, until the wheels can barely turn. This phenomenon does not occur in the digital age. A synchronized clock source sends music samples, i.e. voltage levels, to the speakers at a fixed rate of 44,100 times per second, and if power levels are too low, the circuitry stops functioning. Your mp3 player either works or it doesn't; there is no in between. Even as a kid, I recognized the inaccuracy in the film 2001, A Space Odyssey. As Hal was being unplugged, his singing slowed down, like a cassette tape grinding to a halt, "Dazy, Dazy, give me your answer true", yet speech synthesis is surely digital, and would not slow down in this manner. It would simply stop when the associated circuitry was compromised. Returning to the tape players of yesteryear, there were two common modes of imprecision: wow and flutter. Suppose the supply wheel has a small amount of friction at one point in its revolution. Once or twice a second the back wheel tugs on the tape, which then moves a little slower through the transport. This produces a variation in speed, once or twice a second. The notes seem to move up and down in pitch, producing a disturbing audio sensation known as wow. The music wows up and down. If the song is recorded this way, then the damage is done. However, if the problem is in the player, you can always use another machine. Professional musicians spent good money on their recording equipment, and kept the machines in good working order. Another mechanical imperfection is more common, and involves the capstan. If the cylinder is slightly out of round, or out of plumb, or not well polished, then the tape is pulled slightly slower and faster as the capstan spins, approximately a dozen times per second. The effect is most noticable on the high notes, that seem to jitter in their frequencies. This audio effect is called flutter. Once again, if there is flutter in your recording, then your only recourse is to record the song again on a different machine. The ever vigilant engineer had to guard against wow, flutter, hiss, and other imperfections of the day. In the digital age, flutter and wow are impossible. Music runs at a fixed rate, dictated by the relentless clockwork of solid state circuitry. The audio equipment either works or it doesn't. Imagine my shock then, when I was listening to Chicago and heard flutter in the trumpets. Was this the Twilight Zone? How could my computer possibly produce flutter as it played music digitally from an mp3 file out to my speakers? I listened to another song and another, and each seemed to have flutter in the high frequencies. I plugged the speakers into another computer and played more music, but the anomaly persisted. Finally I plugged my speakers into a cell phone and played music from that source. I had to find a song with some high notes, but there it was again, the unmistakable sound of flutter. I called a friend, an expert in audio equipment both analog and digital, and he was stumped. Maybe it wasn't flutter; maybe it was distortion. This is possible in the digital age. Perhaps, after 15 years of use, one of the capacitors in my amplifier was failing, or perhaps the tweeter cone in the left speaker was damaged. In any case, I feared I might have to buy new speakers, which I could ill afford. When faced with a profound mystery, the best strategy is to walk away and sleep on it, and maybe the answer will come the next day. And indeed it did. On the morrow, I fired up my music again, and it sounded great. The speakers played the high notes with perfect clarity, even at high volume. What was different about today? Was I running other equipment yesterday that interfered with the speakers? I did indeed have other computers running at the time, so I turned them on once again, yet the distortion did not return. And why should it; these computers were not connected to the speakers in any way. Then, as I looked around the room, I put my hand on the offending device, quite by accident, whereupon I slapped myself on the forehead and called myself, in the words of Bugs Bunny, an ultramaroon. Two days earlier I rearranged my office, and in so doing I had moved the fan from the table on my right to the table on my left. It now stood between me and the left speaker, and was running on low yesterday to keep me cool. The blades of the fan chopped the music. It was indeed flutter, about 20 times per second. You've probably heard this effect before when you talked directly into a fan. Slow time down by a factor of ten and watch what happens. when a fan blade is directly in front of your face, your voice bounces off the blade and echos back to you. Add this to the voice that you already hear in your head, and through the air around you, and the sound is just a bit louder. As the blade spins out of the way, your voice is free to propagate between the blades and out to the rest of the room, thus a decrease in volume. Now return to normal time, and the sound of your voice is just a bit louder, and quieter, and louder, and quieter, as the blades spin. The sound modulates in amplitude, approximately 20 times per second, and even faster if the fan is on high. This is flutter, as an engineer might have heard 50 years ago when his capstan was slightly out of round. With the fan sitting between me and the speaker, the blades alternately blocked and unblocked the music on its way to my ear, and the sensation of flutter was unmistakable - and unexplainable, at least for a day. I moved the damn fan back to its original location, and cranked Chicago, with its signature brass, and so many songs that just make me smile. Now that's what I'm talking about!